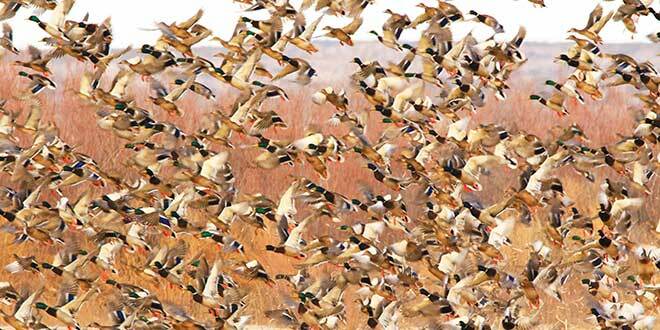 Each fall and winter tens of thousands of ducks, cranes and geese migrate south from their northern breeding grounds and are attracted to the corn, millet and other grain crops grown on the refuge specifically to feed the birds. Bosque del Apache National Wildlife Refuge is undoubtedly one of the best places in New Mexico and the southwestern United States to photograph large concentrations of waterfowl and other wildlife exhibiting natural behavior. Each fall and winter tens of thousands of ducks, cranes and geese migrate south from their northern breeding grounds and are attracted to the corn, millet and other grain crops grown on the refuge specifically to feed the birds. Another seasonal migration occurs when hundreds of wildlife photographers from around the world converge on the refuge to capture images of abundant wildlife cast against a background of blue mountains, golden cottonwoods and orange coyote willows. Some lucky photographers manage to capture rare shots of predator–prey interactions such as a coyote pouncing on a snow goose, or a great blue heron spearing a fish. 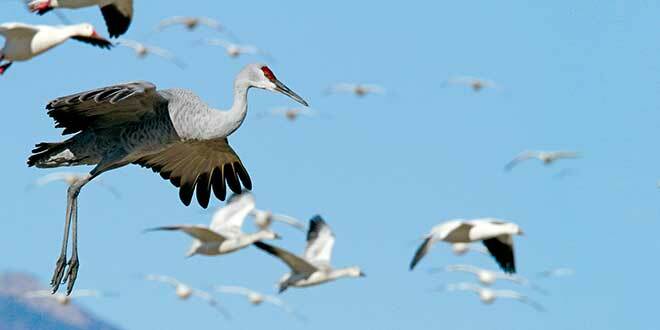 The refuge is literally a world renowned destination for wildlife photographers. 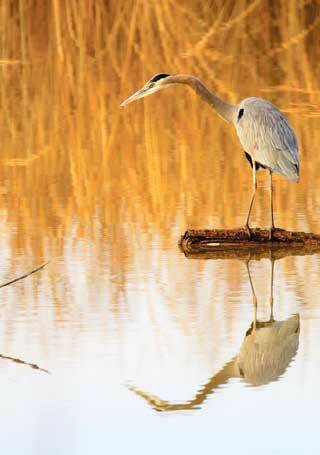 Top: Solitary sandhill crane at sunrise. 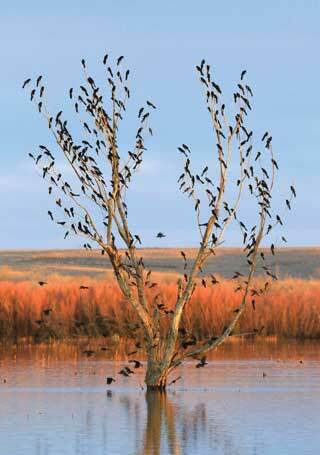 Left: Great-tailed grackles flocking at sunset. Right: Great blue heron hunting for fish at Bosque del Apache NWR. This species can be found at the refuge year-round. Photos by Mark Watson. 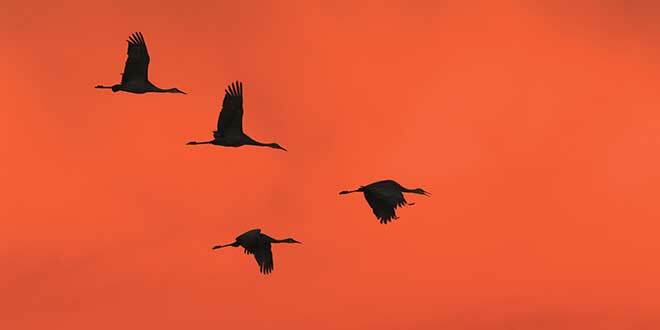 Inevitably, at sunset, the last scene in the refuge before darkness descends is a gaggle of wildlife paparazzi with tripods and telephoto lenses aimed at thousands of cranes and geese gliding to a gentle landing on their night roost ponds. The cacophony of ancient sounds that accompanies the well-fed and happy birds triggers Pleistocene genetic memories. As the cool weather returns each fall and migratory birds begin moving south, my shutter finger invariably starts twitching, and I begin to visualize scenes or species action shots that I would like to capture this season. However, as many trips to the refuge have taught me, the richest photographic rewards always come from multiple visits to the refuge over years and under a variety of weather conditions, with many hours of observation and waiting patiently for novel wildlife behaviors or interactions to occur. Since the wildlife at the refuge are generally habituated to vehicles, a photographer can use his or her car as a blind and sit within a few feet of the birds without disturbing them. Refuge staff have restored hundreds of acres of non-native tamarisk forest to wetlands and shallow ponds that provide secure night-time roosting and day loafing areas for the birds. Parking near these concentrations of birds provides the best opportunity for close-ups. Slideshow gallery. 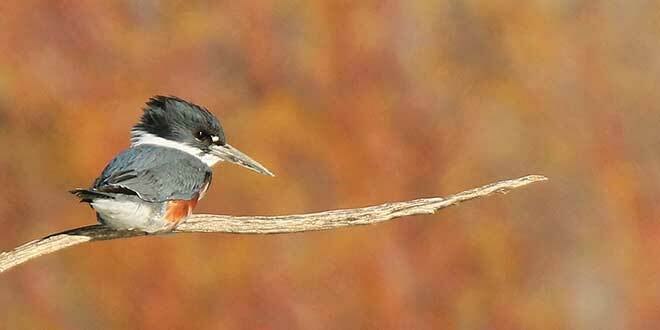 One: A belted kingfisher scanning for fish at the refuge. Two: A sandhill crane gracefully glides to a landing in a corn field. Three: Sandhill cranes against an orange sunset approach their night roosting pond. Four: Hundreds of mallards and other duck species take flight from a cornfield at dusk. Photos by Mark Watson. The image above (slide one) of mallards flushing from a cornfield was taken from a vehicle. In addition to the amazing concentrations of wildlife, the absolute beauty and quality of light at the refuge attracts both amateur and professional wildlife photographers as well. The rarest and most colorful moments are captured during the photographic golden hours of dawn and dusk, when the birds fly out from their nighttime roosting areas or return. 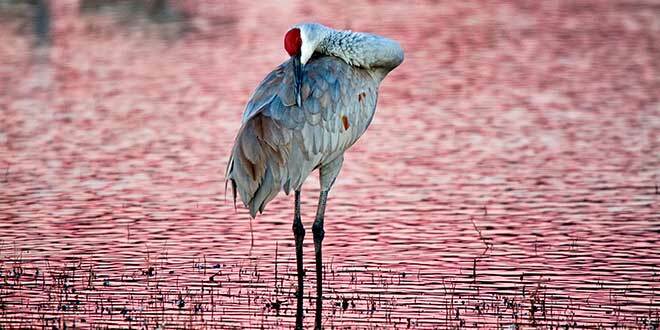 Bosque del Apache provides a limitless and ever-changing pallet of gold, red, orange and pink reflections on the water and clouds as a backdrop for the birds, as demonstrated by the image of a roosting sandhill crane on pink water. After returning from a wildlife photography foray to the refuge, downloading the photos in anticipation and viewing the hopefully fulfilling results, I always count my blessings that New Mexico has been endowed with this gem of a national wildlife refuge and diverse and abundant wildlife populations. I also remind myself that the refuge, and the wildlife that grace it, would not be possible without the legacy of conservation that we have inherited and must continue to support. 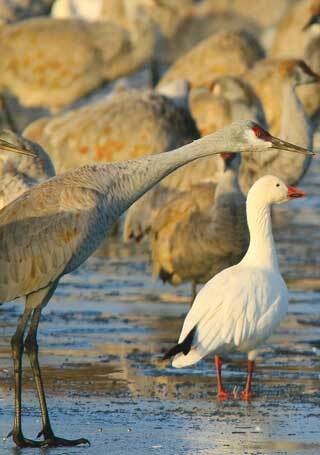 Left: A snow goose looks on while a sandhill crane prepares for flight at first light. 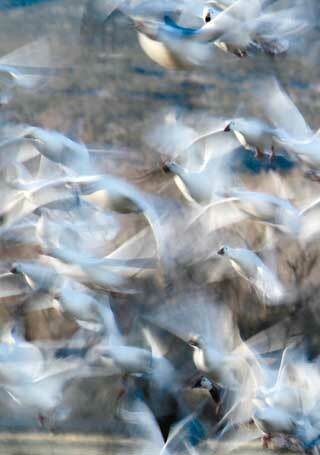 Right: Intentionally blurred image of snow geese emphasizes movement in flight. 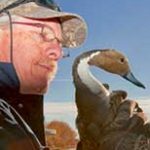 Mark Watson is a biologist and habitat specialist with the Ecological and Environmental Planning Division of New Mexico Department of Game and Fish. Mark has worked for the department for 21 years. He received a Bachelor of Science degree from the University of New Mexico in biology, with emphases in ecology and zoology. In his spare time, Mark loves to hike, hunt, fish, camp and photograph wildlife.